Depart from your Shanghai hotel in a comfortable, air-conditioned minivan and begin the scenic journey to Suzhou, an ancient town famed for the beauty of its verdant gardens. Listen as your guide offers informative narration on the town hailed as the Venice of the east, and then disembark your coach to explore the Net Master Garden. Marvel at the town’s exquisite example of Ming Dynasty landscaping and admire the harmonious style of Chinese garden construction. Continue to the town’s ancient city wall, reputed to date back to 600 BC, and stroll parallel to the picturesque Grand Canal. Conclude your tour of Suzhou with a visit to its 14th-century silk factory then revitalize with a delicious Chinese lunch in a local restaurant. 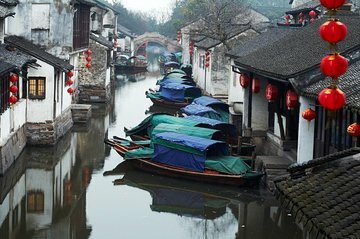 Sated, return to your vehicle to travel to Zhozhuang, a quaint ton thronged with winding waterways and charming structures. Admire the simple, perfectly preserved houses and hear of how the town’s history dates back to the 11th century as you sail the canals in a Chinese-style gondola. Relax during the journey back to your Shanghai hotel and bid farewell to your guide and group upon your return. This tour was interesting and Zhouzhuang is really neat place, we even had a gondola operator sing for us. Some walking, but not too much and not too exhausting. Everything was well done. The food was good as well. Good tour and there were few nice things to take pictures of. This was a pretty quick trip given that both cities are a bit of a drive from Shanghai and traffic was heavy on a Saturday morning. We only had time to see one place in Suzhou, the Net Master Garden. We stopped to see the old city wall, but there was only time to look at it from the distance. We could have done without the obligatory stop at the silk factory, although a number of people in the group did buy some souvenirs. Zhouzhuang was lovely but very crowded with narrow passages that were packed with people as it was a long week-end in China. The canal ride was pleasant but there wasn't time to see much as we had to head back to Shanghai. It would have been nice to have spent more time looking at the shops. Either city could be a day trip all it's own. Unfortunately, I really can't highly recommend this tour. I would say Zhouzhuang is most definitely a place to visit, but you can leave Suzhou out of it. We were picked up at 7:30 a.m. and didn't reach Suzhou until almost 11:00. The traffic in Shanghai is crazy and we had to pick up at 3 other hotels before we even headed out of the city. We could have easily taken the Metro to a central meeting point and avoided at least 1.5 hours of sitting in traffic. Suzhou is a city of 10 million people, so another nectic metropolis. 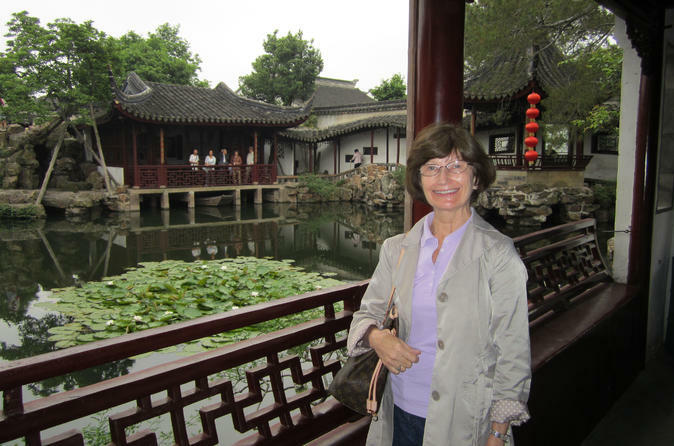 The Net Masters garden is nice, but you can visit Yu Garden in Shanghai which is vastly more impressive. The grand canal in Suzhou is also quite nice, but again not worth all the driving. We then got back into the car for another 45 minute drive to Zhouzhuang. Zhouzhuang is absolutely gorgeous and I would have liked to spend much more time there, but we only had an hour as it was time to get back in the car and head back to Shanghai. Also, we gave the tip to Tom the tour guide, but I think we should have split it ourselves between Tom and the driver, who was absolutely fantastic. We assume Tom split it with him - we hope so anyway. We had tossed up between this trip and the bullet train to Hangzhou - we definitely regretted our choice. Great tour, very special to visit this village. Just don't mind the tourist-traps! This tour unfortunately did not meet up to my expectations. All my friends told me that I had to do a water village tour, so I saw this one on Viator and decided to book it. Our tour guide was Tom, who spoke decent English but that's perhaps the only good thing I can say about him. Tom unfortunately had a tendency to shout at us - while I understand this might have been part of his effort to be articulate, it's not the most pleasant experience when you're with him in a small van. I also found his tour guide skills lacking - you know how on some bad tours your tour leader doesn't say much and there are long stretches of silence? That was how it was with Tom, who had moments where he shared some information but was not really proactive about giving us background and insights into what we were seeing - expect to mostly sit in awkward quiet actually. At times, the only thing he seemed to know what to say was please make sure to have all your belongings, which he emphatically say so many times that I felt like I was being scolded at. On top of that, the lunch place we went to was rather subpar - definitely a spot specifically catered to tourists, and was rather sad looking. Save yourself the money and book another tour. Beautiful! Both Suzhou and Zhouzhuang are both worth seeing and a complete contrast to the busy city of Shanghai. There is lots of travelling by bus/minivan involved as they are quite some distance outside of the city but well worth it. The tour guide contacted us the day before to confirm our pick up time, she was very friendly and was very knowledgeable at both locations. Would highly recommend. It was a all day tour. Lunch was delicious. I love the Water Village. Both the cruise and shopping were excellent. The main downside of this trip was that we were first to be picked up at 0730 we then spent 2 hours going round Shanghai picking up 4 other groups. We were returned to our hotel at 8pm in the evening as we were the first on we were also the last off. So 12.5 hours in a cramped uncomfortable van was not my idea of fun. The trip to Suzhou and Zhounzhuang Water Village was very good and if you were lucky enough to be last one and first off the day would not have been too arduous.